The B330-S is fairly soft for greenside control but loses nothing in length due to its high trajectory flight. It is ideal for the quicker swing speeds or for anyone with a naturally low trajectory who feels his or her shots lack spin.This ball has reduced spin off the driver head and the core promotes the velocity needed to launch the ball on a flight which guarantees distance. A golfer feels in control when using the B330-S which is a consistent help to a consistent strike.This is a popular ball amongst professionals who need to convert distance off the tee into birdies by peppering the flag or by giving them control when missing the green to give themselves a real chance to avoid dropping a shot. Bridgestone began making golf balls in Japan in the 1930s when they were merely something of the right shape and size to play the game, round. The golf ball nowadays is a thoroughly researched market with the leading manufacturers spending a good deal of time and energy to provide golfers with a ball to enhance and improve their game. At Lost Golf Balls we ensure that all golf balls which pass through our hands in properly cleaned and inspected to ensure Bridgestone’s hard work gives our customers the best chance to enjoy the B330 Range. The B330-S is designed for quality players who love to see a well hit drive fly a mile into the distance, but still want a soft touch and high spin around the green. In respect to other tour balls such as the Srixon Z Star, Titleist Pro V1, Titleist Pro V1x, Taylormade Penta and Callaway Tour Is or Callaway Tour Iz the B330-S delivers huge distance yet still matches it with the others in terms of control. This is a ball made for golfers who can hit the ball hard and soft in equal measure at if you play with any of the listed balls above it would be worth your time trying out this addition to the Bridgestone range. Great way to by golf balls and gear, however there should be an area on the order page for special instruction regarding delivery, I have to keep chasing the courier firm to tell them how I would like the goods delivered. Perhaps I am missing something, but I don't see any place to entre instruction... Read More. Great way to by golf balls and gear, however there should be an area on the order page for special instruction regarding delivery, I have to keep chasing the courier firm to tell them how I would like the goods delivered. Perhaps I am missing something, but I don't see any place to entre instruction when I order. They delivered what I ordered and before I expected them to arrive. Great service and a good product. The whole transaction was pleasant and stress free. Many thanks and will purchase again. Good quality, fast turn around. The Bridgestone B330-S: Great Control With Boom Off The Driver The B330-S is fairly soft for greenside control but loses nothing in length due to its high trajectory flight. It is ideal for the quicker swing speeds or for anyone with a naturally low trajectory who feels his or her shots lack spin.This ball has reduced spin off the driver head and the core promotes the velocity needed to launch the ball on a flight which guarantees distance. A golfer feels in control when using the B330-S which is a consistent help to a consistent strike.This is a popular ball amongst professionals who need to convert distance off the tee into birdies by peppering the flag or by giving them control when missing the green to give themselves a real chance to avoid dropping a shot. Basic information of the B330-S: - Urethane Elastomer cover - Soft Gradational core - 330 dimple design - 4 Piece Bridgestone began making golf balls in Japan in the 1930s when they were merely something of the right shape and size to play the game, round. The golf ball nowadays is a thoroughly researched market with the leading manufacturers spending a good deal of time and energy to provide golfers with a ball to enhance and improve their game. At Lost Golf Balls we ensure that all golf balls which pass through our hands in properly cleaned and inspected to ensure Bridgestone’s hard work gives our customers the best chance to enjoy the B330 Range. The B330-S is designed for quality players who love to see a well hit drive fly a mile into the distance, but still want a soft touch and high spin around the green. In respect to other tour balls such as the Srixon Z Star, Titleist Pro V1, Titleist Pro V1x, Taylormade Penta and Callaway Tour Is or Callaway Tour Iz the B330-S delivers huge distance yet still matches it with the others in terms of control. 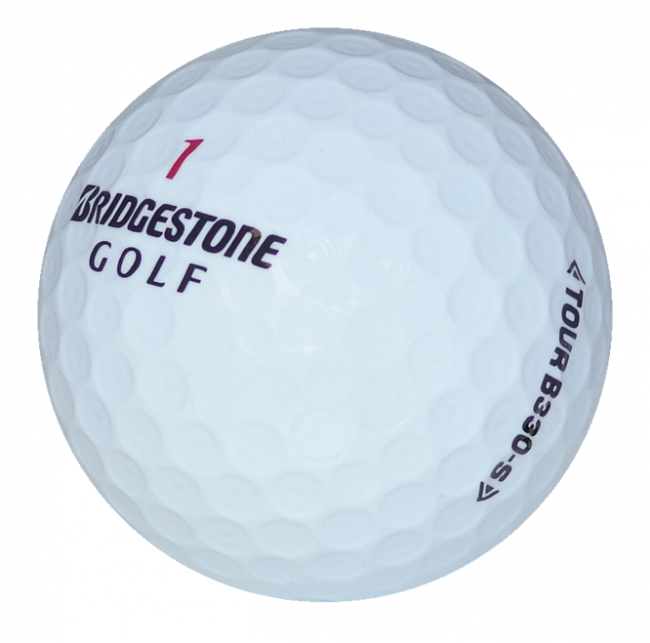 This is a ball made for golfers who can hit the ball hard and soft in equal measure at if you play with any of the listed balls above it would be worth your time trying out this addition to the Bridgestone range.